For those of you following XenDesktop news, there is now confirmation that the XenDesktop Beta has begun. This is not to be confused with the Citrix XenDesktop Tech Preview which came out last year. Internally this is viewed as being the second wave of XenDesktop made available to customers. From a very simplistic level, here is how it works. It is interesting that VDI is mentioned on this page. Confused? Hopefully your question is on the XenDesktop FAQ. Q How does Citrix Desktop Server relate to VMware and VDI? A Citrix Desktop Server is a complementary enabler for VMware solutions. VMware has defined the concept of Virtual Desktop Infrastructure (VDI) to describe the use of their ESX Server 3.0 when hosting desktop OS instances. 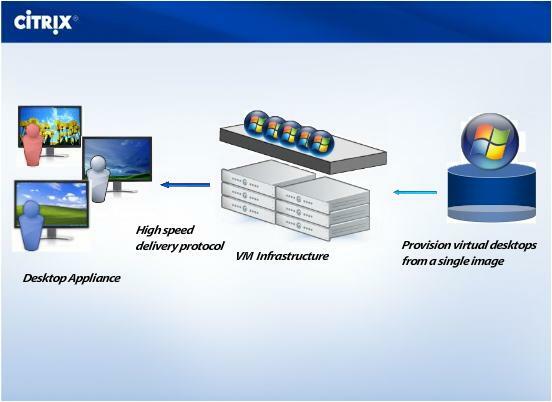 CDS is complementary to VMware’s VDI by fulfilling the role of a connection broker, providing managed- and secure-access to a virtual desktop. For the additional functionality required to build a full VDI solution, VMware has created a partner ecosystem that includes Citrix. Citrix Desktop Server, along with other Citrix products, can be used to deliver a complete VDI solution. Citrix Desktop Server is the old name. XenDesktop is the new name. Well, the Citrix Desktop Server name is still being used internally and is considered different from XenDesktop in nature. However, I think this will only confuse the market when mentioned externally. There should only be one product definition. Q How is Citrix XenDesktop different from Citrix Desktop Server? A Citrix XenDesktop is a new product line. It is an integrated desktop delivery system that includes the next release of Desktop Server technologies, Xen virtualization infrastructure, and virtual desktop provisioning. The news from the FAQ which is new to me is the dropping of DDI acronym and the acceptance of the VDI term. Getting back to the point, XenDesktop Beta is now available for trial. For at least a month the Sydney and UK team have worked hard to close down issues for the Beta. It is great that it is now being released. If you would like the shortcut to the download page, here it is. your blog is really a “must read” since months – thanks! I just completed the form on the XenDesktop Beta link you posted. Unfortunately, I get an error message when I click continue (tried with IE and Firefox). Sorry to take so long to get back to you. I looked into what was going on at the time and never got a decent answer as to what was going on. I had tried downloading for myself and could not get through. Hopefully my emails stirred some interest in fixing it. Thanks for the compliment. Some days it is hard to come up with something to write about. It is not that there are not lots of things to talk about but rather it seems that it is unclear what value I will add to the topic.